I’ve spent my entire life people watching and creating little stories in my mind and it’s always been something I’ve yearned to share with others. One of the greatest things to come from the internet is the wonderful array of whimsical and dreamy photography available. Lately it’s these very photographs which send my mind into constant states of imaginative flurries both during the day and most annoyingly at night. I’m constantly jotting down ideas that come to mind when something captures my heart and imagination and for the first time I will now begin sharing these stories with you all. So without further ado continue below and discover the first short story in a new Untitled blog post series which I hope you will all enjoy. As she made her way further down the lane it seemed all she could focus on was the pressure of the humidity around her. It felt like a suffocatingly thick and coarse blanket and it’s heat was becoming utterly unbearable as she made her way up the steep street. She could no longer admire the narrowly quaint cobblestone lane lined by charming terrace homes but cursed them for towering above and greedily hindering the cool Mediterranean breeze from reaching her. She could hear rumbling voices echoing in the distance and soon enough the source of the sounds came into view. Their bellowing laughter and curious eyes left her feeling rather self conscious; she suspected her bright red face was the subject of their laughter. Nervously she began playing with loose strands of hair, pulling them back behind her ear and inhaling deeply, hoping to extinguish the unease. Though as they near her anxiety rises. But thankfully they continue past her with a friendly nod and a streak of light shining up ahead distracts her from politely gesturing back. She hurriedly continues her way up the steep path, pushing through the pain in her thigh muscles and only allowing herself relief to slow down to cautiously approach the light source. 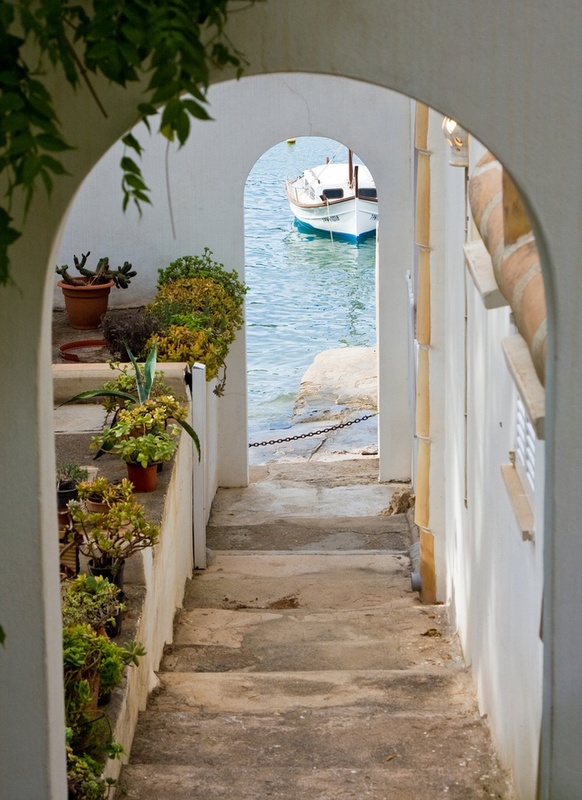 She finds herself at an archway leading down to the ocean in a mere handful of steps. She remains paused at the entrance, allowing the refreshing breeze to wash over her while the clear turquoise water transfixes her with it’s soft waves gently beating against the rocky shoreline. Composing herself she takes in the weathered stair clad walkway. Unsure where it may lead her she begins to doubt if she should continue further. Reaching into her pocket she pulls out the rough handwritten note that was left behind for her the other night and softly traces words that have been read countless times with her finger. She hoped the author was the mysterious local she kept encountering whilst on the island. Then again, what if it wasn’t? What was she to do? She felt like turning back and returning to the comfort of her hotel room but she knew better. She had traveled arduously all this way in the heat and knew she had to see it through. Taking one last deep breath while smoothing out the wrinkles of her white dress she takes the first step down towards the ocean and the unknown.